America Needs a Social Revolution!
"" paraid="1851878447" paraeid="">I support Bernie Sanders. I may regret this decision, just as I regret the decision to vote for Obama in for his first term. I boycotted his re-election. I could have voted Green but in South Carolina, I would just be wasting my time. I should have voted in the local elections, but I didn't. I then tried to run against Tim Scott for the Senate seat from South Carolina, but I got not support from anyone. Can you imagine anyone more disenchanted than I was? I have been writing about the disparity between the rich and the poor fr more than a decade. I've written about campaign finance reform for as long. When you read Daily Kos or Campaign for America's future, know this, when I wrote an article a month before Obama's election, telling everyone that he lied about not taking corporate contributions, and I disclosed that his second largest contributor was Goldman Sachs, they threw me off and I haven't written for them since (except for when they pull an article from a website that does publish me. I know that they are just Democratic mouthpieces. I am 65 years old next month. and I served in this nation's military for 21 year sand had had a secret clearance. I'm not a revolutionary radical. Well, maybe not back then. maybe I am now. I want ask everyone in this nation a question. How long does it take to realize that your government has completely become what you I want to once hated? We hated the Soviet Union because it spied on it's own people and made war on Afghanistan and occupied Eastern Europe. I would like to ask you all a question, are we not doing the same thing now? Can someone to tell me what the difference is between the old Soviet Union and America today? I'm sure some patriotic person will tell me that we have "free speech" and the right to bear weapons and "free" elections. Well I'm here to tell you that we don't have free speech and we don't have free elections. We have free speech on the web, but that's all. The The political parties that dominate are run by corporations and the rich, the anchors of all the news shows lie through their teeth about almost everything, and I'm not just talking about Fox News. MSNBC, CBS, CNN and all the others lie shamelessly. Why am I writing this? Why do I put myself through this? Look, I just had three massive strokes not less than a month ago. Personally, I don't care what happens tomorrow because I don't think I'll be around much longer, but and I owe it to my Granddaughter to speak out so that her world will be better, and because she is the brightest person I have ever met. So what am I trying to say here? Why do I believe that Bernie Sanders is different than Obama? Isn't this more "bait and switch" politics? I don't think so. Sanders is old like me. He has been his own man for three decades. I don't agree with his every vote but nobody is perfect.His support for Israel and the intervention in Kosovo are examples, but In a two party system, or with any system for that matter, nobody is perfect or suited to every individual. Nobody is perfect least, of all me. Something I know from writing for almost over a decade about politics, is that even before Citizens United, the corporations and the extremely wealthy funded both major political parties. The last three decades it has been a choice between the lesser of two evils. I know today that evil is still evil, whether it lesser or not. I believe that our government is being led overtly or covertly by evil people. It has been like that for a long time. To know this and not do anything about it is tantamount to supporting it. This is what the German people did in 1934. The World demonized them for staying silent. We are doing the same thing. It really doesn't matter if you are pro or anti abortion. for or against LGBT rights or not. Whether you are left or right, conservative or liberal. red or blue or anything else. The only thing that matters is the future of this nation, this planet and your heirs. It has to do with your responsibility as a human being to your offspring and their offspring.It's about your freedom and our y well-being. It's as simple as that. Bernie Sanders espouses a "political revolution.". I disagree. Political revolutions are a dime a dozen and they usually turn out to be the just more or less of the same old thing. We don't need a political revolution, we need a social revolution. The people need to stand up. Not just Republicans or Democrats or Independents but everybody. We need to tell the government of the United States that we don't want the Middle-Class and poor to live like serfs to the uber wealthy. We also don't want the Military Industrial Complex spending 56% of the nation's discretionary spending on the military! We don't want to be spied by the on by the NSA and we are tired of the government justifying it on the Muslims, the Russians or any other Patsy they can dream up. The fact is that we spend 6 times more on defense than we did during WWII (adjusting for inflation. We are tired of endless war and the death and destruction of entire nations. 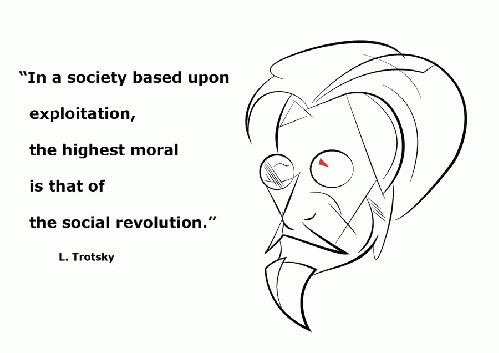 That is what a social revolution is. I believe that is what Sanders will give us. I now that many (especially women) want a female President. Hillary Clinton is a bad choice. Wait for Elizabeth Warren or someone else who knows what time it is. Give this movement time. I believe this is where Occupy has found it's voice. I think have said enough.